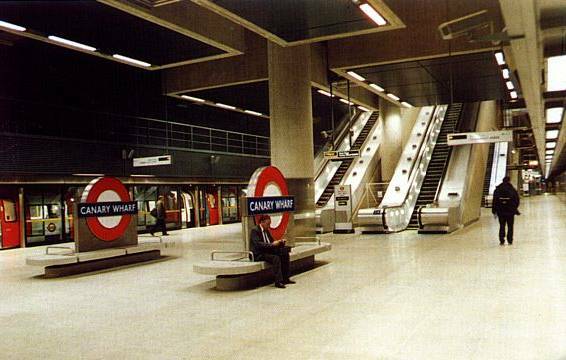 Pictures showing aspects of London Underground including stations and trains, with some historical pictures of trains. Each photo has a full size view with a description. London Underground is obsessed with steps and gaps, perhaps because, since they stopped having staff on platforms, the number of reported accidents has risen. Here are some photos showing the problem. Fig 1: 1967 Tube Stock step at Victoria. The step plate of the doorways on the Underground was originally designed to cover the gap between the train and the platform. Introducing a level step between platform and train will re-introduce a gap which wasn't there before. Fig 2: 1973 Tube Stock step out at Ruislip. The platform here is higher than the train floor because the platform has to accommodate both tube and surface stock trains. Fig 3: A Stock step at Ruislip. This step is at the same station as shown in Fig 2 but the step is up from the platform to the train because this is surface stock. Of course, these steps mean that LU does not comply with the new disabled passengers requirements. They won't unless a huge amount of money is spent rebuilding tunnels and stations. The cost would be beyond all reason to satisfy the wishes of a few unfortunate persons. In Tubeprune's view, such expenditure defeats the purpose of a "rapid transit railway" by turning it into a huge ambulance service. Who would wish to spend huge sums of money straightening out all the curved platforms in London, like those shown below? Fig 4: C Stock step at Monument. Because the station was built on a curve, the track is canted (raised along the outer edge of the curve) to minimise discomfort to passengers. The cant causes a vertical gap between the train and the platform in addition to the horizontal gap caused by the curve. Fig 5: The reverse curve at Victoria (District) with a D Stock in the station. This causes a step up at one end of the platform and a step down at the other end. Fig 6: 1996 Tube Stock at Finchley Road. Finchley Road serves tube and surface stock trains but they have their own platforms. However, the station is on a serious curve which causes the sort of step seen in this photo on the Jubilee Line SB platform. It seems odd to Tubeprune that whilst the large majority of Londoners say they would rather not have to use the tube, a few disabled people are forcing others to pay for their right to use it. Strange world, isn't it? Gaps between cars are also a source of trouble, again because staff are no longer around to oversee platform safety. Most LU trains are now provided with inter-car safety barriers as shown here below. Fig 7: C Stock barrier at Whitechapel. The barriers are made of black canvas mounted on spring-loaded carriers hung off 'blisters" at the corners of the cars. They are a niuisance to maintain but now that people have to be protected from themselves, such expensive and ugly precautions have to be provided. 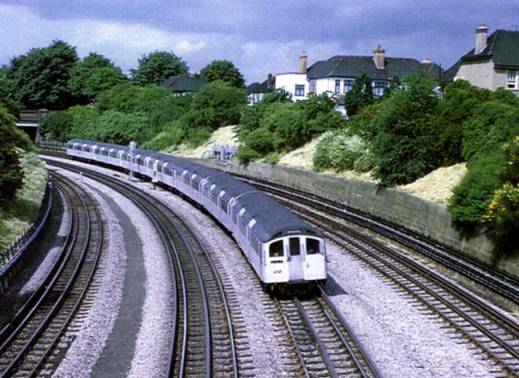 Fig 8: 1992 Tube Stock without barrier at White City. The "blisters" are mounted ready for the barriers but they have not been fitted. The barriers have to be removed when it is necessary to split up trains for maintenance and then someone has to remember to put them back when the units are coupled. London Underground has some interesting stations underground. The following photos show various places where there are some special features. Fig 10: Baker Street Circle Line platforms (5 & 6) showing the station as restored to close to its 1863 condition in 1987. The recesses in the station walls were originally open to the street and provided light and ventilation. The brick arched roof was a common form for the cut and cover construction used at the time. Fig 11: Great Portland Street has also been restored. Further work is taking place now. The roof uses steel girders to support the buildings above. Fig 12: Gloucester Road (District) has had a very good restoration with the original brickwork exposed and new lighting installed to represent the original gas lit globes. Fig 13: This is a view of the disused Metropolitan Railway platform at Gloucester Road, which is now used to display art at various times. In this photo, Dinosaur models are used to advertise the Natural History Museum. The photos above show the original station designs of the 1860s when the first sections of the Underground were built. Tunnels were in cut and cover style and trains were operated by steam locomotives. In order to provide ventilation, openings were provided at regular intervals and many of these still exist as the photos of Notting Hill Gate (below) shows. 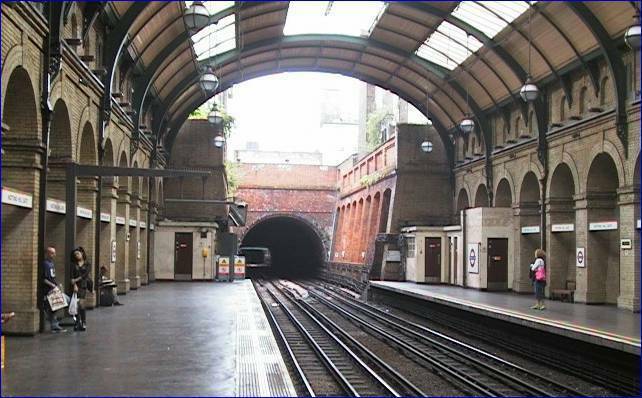 Fig 14: Notting Hill Gate (Circle Line) showing the overall roof, brickwork and typical tunnel construction used for the original Underground stations. To provide ventilation for the steam locomotives, there were many short open sections as shown here. Many of these have now been built over. Fig 15: Aldgate East gateline with a view of the station platforms through the glass screen behind them. Many stations have had to be altered to accommodate the automatic fare collection system. Tube stations were deep underground and had a characteristic design due to their circular construction. Some have survived in near original condition. Belsize Park (below) is a typical example. Unfortunately successive additions of cables and signs for new lighting, fire alarm systems and other paraphernalia have spoilt the clean lines of the original design. Fig 16: Typical tube station platform of the 1905-7 era, as seen at Belsize Park (Northern Line). A number of similar stations have been restored to show the original decor, tiled rings and mosaics. Fig 17: In this photo of the station headwall, it is interesting to see that there is a 7-car stopping mark in place on the track just inside the tunnel. There were a number of older stations on the Northern and Piccadilly Lines where a 7-car train was too long for the platform. The only way all passenger doors would be opened onto the platform was if the driver stopped with his cab in the tunnel. The rear cab was also left in the tunnel. Some locations require a pair of doors to be switched out so that they don't open into the tunnel. Click on the image for the full size view and description. 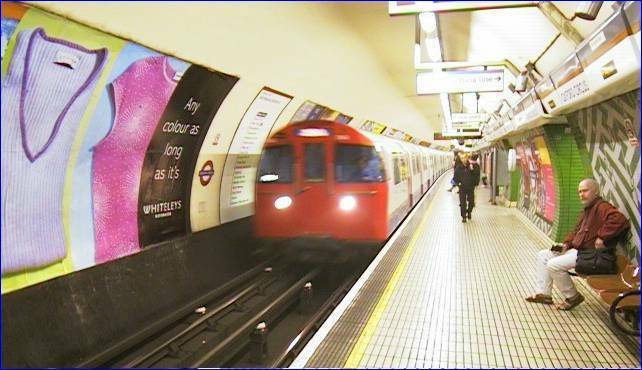 Fig 18: Victoria, Victoria Line where the numbers of passengers have risen to levels where the platforms are too narrow at times. The platforms widths on the Victoria Line were one of the victims of a cost cutting exercise which took place in the mid-1960s when the line was being built. Fig 19: Modenised platform at Oxford Circus, Bakerloo. The original station dates from 1906 but it was rebuilt for the Victoria Line in 1967 and upgraded after a fire in 1984. Fig 20: New Jubilee Line platform at Westminster. 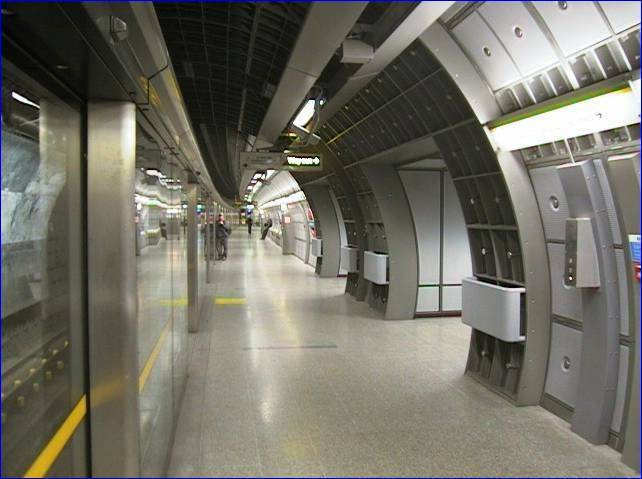 All the new tunnel stations on the Jubilee Line extension are provided with platform edge doors, as shown here, principally to prevent suicides and accidents, currently running at over 100 per year. Fig 21: Canary Wharf, Jubilee - an excellent design of station with wide, island style platforms and enough escalators. The countryside around London has a number of stations with rural or suburban features. There is a wide variety and some are shown below. Fig 22: Hillingdon, Metropolitan Line which was rebuilt in 1991as part of the A40 road improvement scheme. Fig 23: Ickenham, Metropolitan Line. Fig 24: Sudbury Town, Piccadilly Line dating from the 1932 expansion of the line. 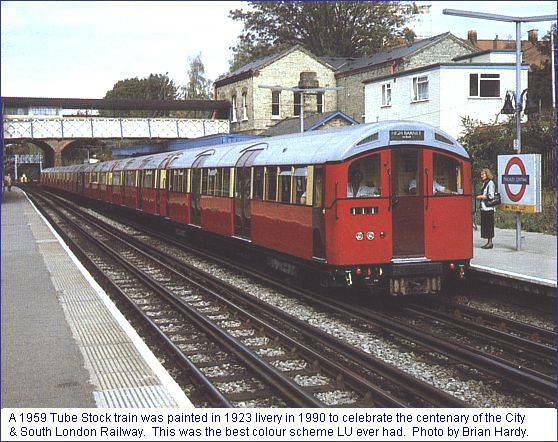 Fig 25: North Ealing, Piccadilly Line which was built in 1903 for the District Railway extension to South Harrow. Fig 26: Ealing Common, District Line, which was rebuilt in the early 1930s. Fig 27: Uxbridge, Metropolitan Line which was relocated in 1932 and given a cathedral like concrete train shed. Here are a few photos of London Underground rolling stock of the past. Beginning with tube stock, perhaps the most non-standard "Standard" stock in the world was used on the tube lines from the early 1920s until the mid 1960s, when the last was withdrawn. 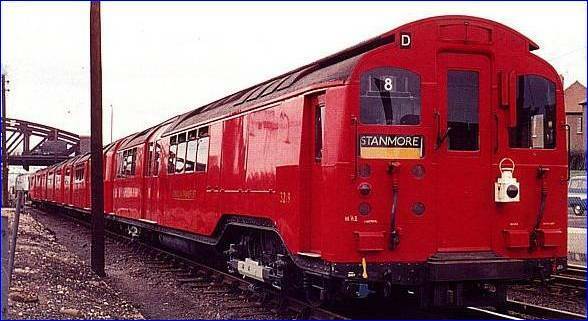 The Standard stock was modern in the 1920s but was replaced in design excellence by the 1938 Tube Stock. The standard stock was actually quite inflexible, since it had three types of traction equipment and various arrangements for door and lighting control which restricted the way it could be coupled and made up into trains. 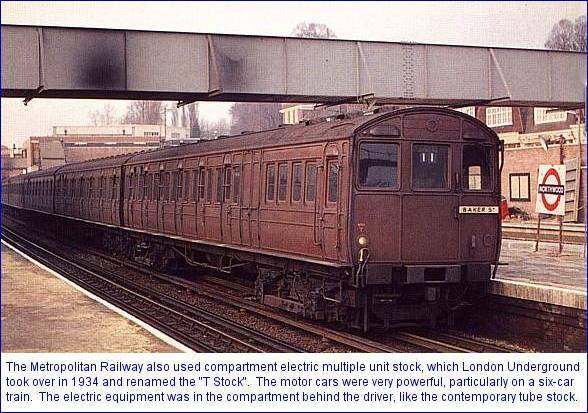 In the 1950s, the Central Line had two types of Standard Stock which were unable to couple together because of different battery arrangements. The stock also suffered because the control equipment was mounted in a compartment behind the driver's cab and, as a result, on a 7-car train with three motor cars, 15% of passenger space was lost. It was also noisy to drive, because the air compressor was mounted immediately behind the driver's seat. Fig 22: Standard Tube Stock comprised various batches built between 1922 and 1934. The last of the type ran in passenfger service in 1966 on LU and some went to work on the Isle of Wight until they were replaced by 1938 Stock in 1988. The Standard Stock has its control equipment behind the driver's cab which resulted in a loss of passenger space amounting to 15% of the train's length. 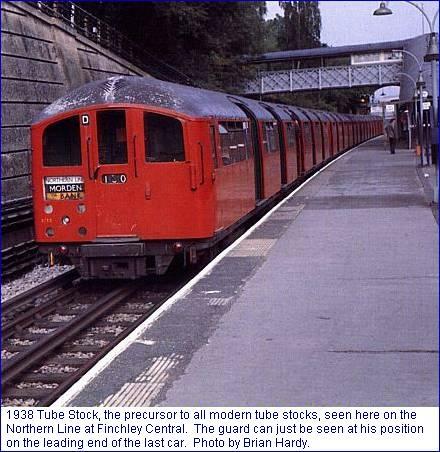 Fig 24: 1959 Tube Stock in original condition on the Piccadilly Line. One of the best colour schemes to come out of the Underground was the early 1920s livery used on the tube lines, which appeared again in 1990 on a 1959 Stock train on the Northern Line. Tubeprune understands that at least part of this train is still around. Fig 26: Metropolitan Electric Locomotive with train at Neasden. The Metropolitan Railway was independent of the other Underground Lines until 1934. This independence showed in its rolling stock, which was more main line in character than the other Underground lines. It used compartment stock for locomotive haulage and some EMUs. It also used saloon stock (not shown here) for its electric services. This all disappeared in the 1950s. The District also had a wide variety of rolling stock. The first electric stock was built in 1903 as a trial for the main line electrification of 1905. The main batch of stock was the B Stock. Other types were added over the years, examples of C and F Stocks being shown below. The District operated three separate and incompatible types of stock from the mid 1920s until this was reduced to two in the 1970s. 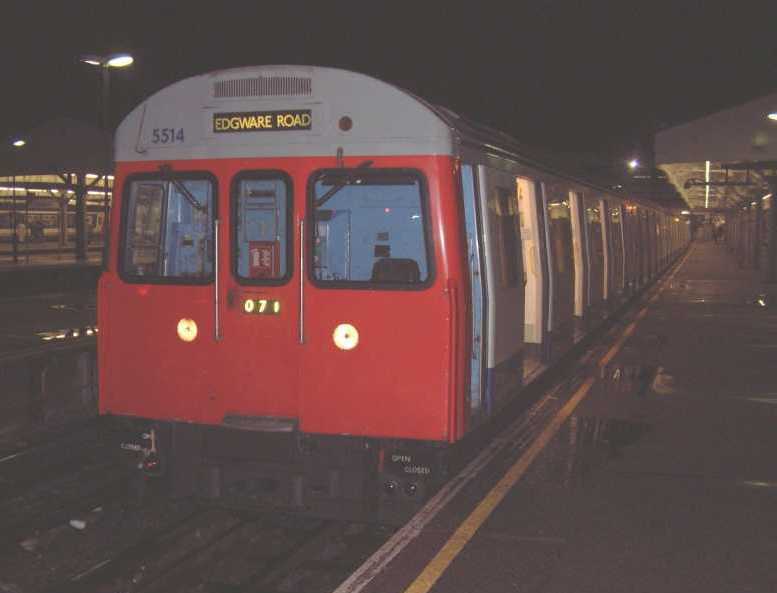 It still has to operate two types of stock because the longer trains of D Stock will not fit in the platforms between Edgware Road and Notting Hill Gate, so C Stock has to be used. Fig 22: District Railway A Stock, two 7-car trains built for testing in 1903. Fig 23: District Railway C Stock of 1910. Fig 24: F Stock of 1920 as running in 1963. The District was the pioneer for the unpainted aluminium car bodies, first introduced in the early 1950s on the R Stock. The various trials carried out then led to the ordering of aluminium bodies for all the new stocks built in the 1960s to 80s. The unpainted car replaced the red car as the symbol of London Underground train design. In 1984, graffiti began to appear in London and attempts to clean it off the unpainted bodies were usually unsuccessful. Cars began to look very shoddy. Since the introduction of graffiti proof finishes, the painted car has returned and now the D Stock is the only unpainted stock left in service. Finally, a "new" old photo of an original Metropolitan Railway electric locomotive as built for the original electrification of 1905. This photo was kindly supplied by "teckytony" from an orignal plate. Fig 28: Metropolitan Rly. British Westinghouse electric locomotive. 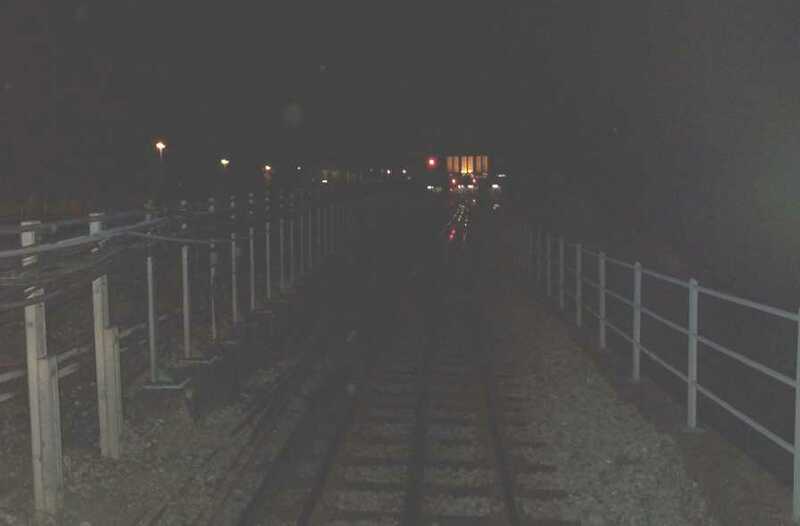 Fig 28: Driver's view of the approach to Southgate Tunnel Mouth. Photo by Tube Troll. The entrance to the tunnel is actually bell-mouthed in order to reduce the pressure change as the front of the train enters. However, this does not stop your ears popping as the train hits the opening at speed. The approach to Southgate is quite fast - about 45 mi/h - and an understanding of where the station is in advance is essential to enable the driver to stop the train in the right place. This is an example of why drivers are required to undergo a period of "road training" for each line they work on. 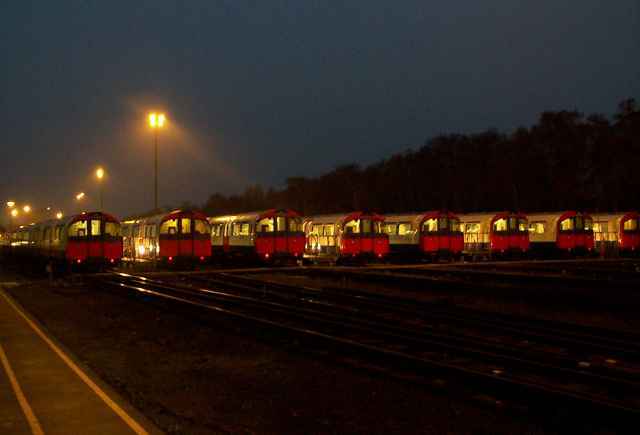 Fig 29: The early morning line-up of trains in Cockfosters Depot, Piccadilly Line. Photo by Tube Troll. Fig 30: Wimbledon in the wet. An damp evening view of a C Stock ready to depart for Edgware Road. Photo by District Dave. 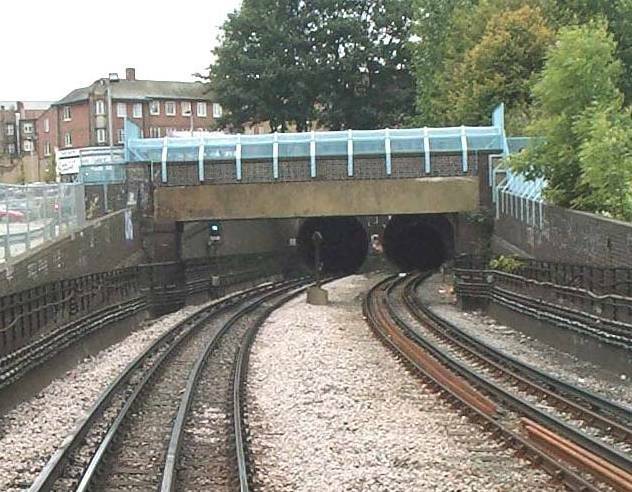 Fig 31: Driver's view of the approach to Acton Town, EB Piccadilly Line coming from Rayners Lane. Photo by Tube Troll. Photos are being collected to go here. Would you like to contribute some? Many people already have. Please e-mail Tubeprune.